Biggest QR Code Ever, or just the Goofiest? Home / Blog / Uncategorized / Biggest QR Code Ever, or just the Goofiest? While checking out the recent face lift of Southdale Center (America’s first indoor mall) I couldn’t help but notice this. A huge poster (not for Marshall’s, by the way) promoting The University of South Dakota. Even more striking than the gigantic QR code was the truly awkward photo. Was it meant to be annoying or just peak our curiosity? Probably both. I took the hook and was treated to a nearly 2 1/2 – minute video that shared the journey of a freshman who found her way to SDU while she was enrolled and ready to attend college in Colorado. She even had two IDs to prove it! 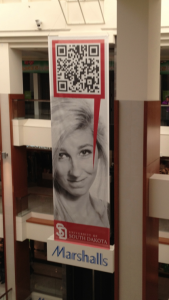 I appreciate the marketing value of QR Codes, large format posters and using high production value, testimonial video. But this combo stuck me as a bit odd. Check her video out here http://kaywa.me/k2wig and tell me what you think. PS If you like the idea of adding testimonial video to your next project, ask me about a new user generated video format called Bravo.